As a senior runner (in age, not experience) I find that I naturally gravitate to chat rooms and discussion groups involving older runners. I have found a super group on Facebook called “Running after 60,” which is full of people my age who are running w-a-y faster, w-a-y longer and they all seem full of beans. I find their stories quite inspirational – partly because everyone is so low-key and un-brag-y about their achievements. From time to time I’m going to showcase some of these fab older folk (they are mostly in the US) and I thought this funny story, below, was a perfect one to kick-start this series. A lady from Kentucky, called Tippi McTyeire shared this story on Friday, the day after Thanksgiving. “The things that make you feel OLD. 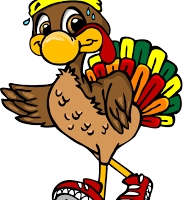 I ran the 10k Turkey Trot in 58:21 & won my age group. I felt good. Young man next to me asked what my plans were. I suddenly felt Biblical in age. And yes, you are right, Christine, runners are like old wine. I figured that at my personal best, to qualify for the Boston marathon, I’d have to be a 70+ woman.